The Court for Urgent Matters has ruled that police officers can be redeployed permanently on university campuses. Police officers were banned from campuses by a High Administrative Court ruling in 2010. The ban was challenged by supporters of the interim government amid widespread protests, mainly by Islamists, on campuses following the ouster of Islamist president Mohamed Morsi. In response, the cabinet allowed police to enter campuses to quell the protests. Police have frequently stormed campuses to break up protests, leaving a number of students dead and dozens arrested. Monday's court ruling comes after the government postponed the beginning of the new semester until 8 March for security reasons. 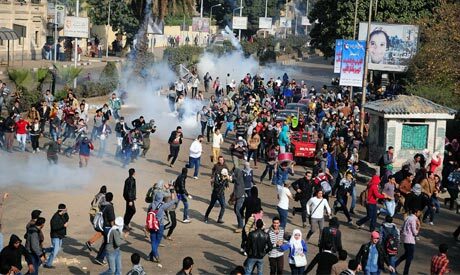 Last week, interim President Adly Mansour amended a law to allow university heads to expel student protesters. Mansour said students could be expelled for endangering the educational process or targeting a university's facilities, work or exams, attacking people, public or private property inside the campus, and inciting or participating in violence. This is awesome news. The university is for education, socialization and broadening horizons, not a place for terrorism to flourish. Hurray Egypt !! Salaam, first of all, I'm a secular Muslim, working as sr. manager banking and finance services in Amsterdam. does sawsan think that his shouting make things which are totally wrong right by using capitals? Of course will scaf cronies plead for more police state instead of less. 400.000 Egyptians on the payroll of 21 headed scaf snake and enough to fill tahrir square. Where is the prove MB has committed terrorist acts? Where are the Maersk size containers with so called 22 million signatures? Where is the prove 30 million demonstrated against professor Morsi? Before SCAF came into power decades ago, economy equaled zouth korea, after 40 decades scaf policies it equals north korea. SCAF will make you sell your history as beggars serving their western and Israeli masters in resorts instead of building the future for Egypt with 80+ million people. The reason why dictators like ksa supports you is because they are afraid they are next in line to lose their self-proclaimed eternal power. THERE SHOULD BE POLICE OFFICERS ON CAMPUSES . WE WERE AT THE UNIV. WHILE HAVING POLICE OFFICERS ON CAMPUSES , WHAT WAS WRONG WITH THAT??? NOTHING AT ALL . I THINK ALL PEOPLE SHOULD BE HAPPY FOR THIS COURT APPROVAL UNLESS THERE ARE PEOPLE WHO WANTS OUR UNIV. TO BE BURNED AND DESTROYED BY EKHWAN TERRORISTS .